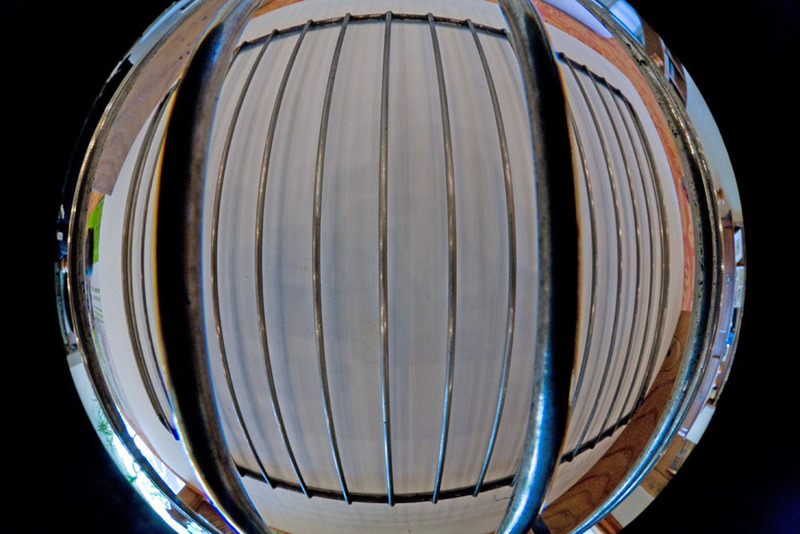 I have done a few panoramas which the subject was very close to the fisheye lens. Some have become famous. Some are still to be shown at the date of this writing. Stitching errors (sometimes huge). There was also very bad Control Point concordance on some seams. 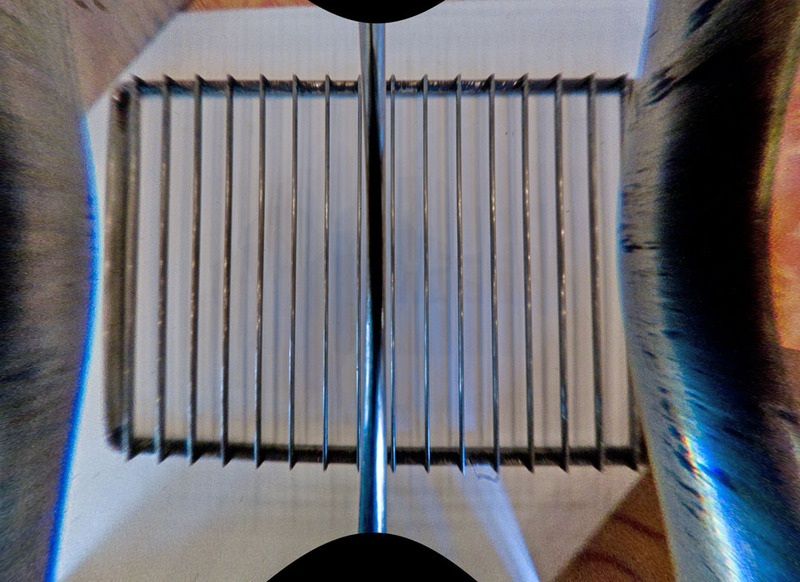 Some straight edges or straight objects shot at very close distance and on a single image would appear unduly bowed when viewed in a rectilinear projection. Edges of objects very close to the lens exhibits strong Blue-Yellow TCA while the objects a little farther on the same shot have classical Red-Cyan TCA. 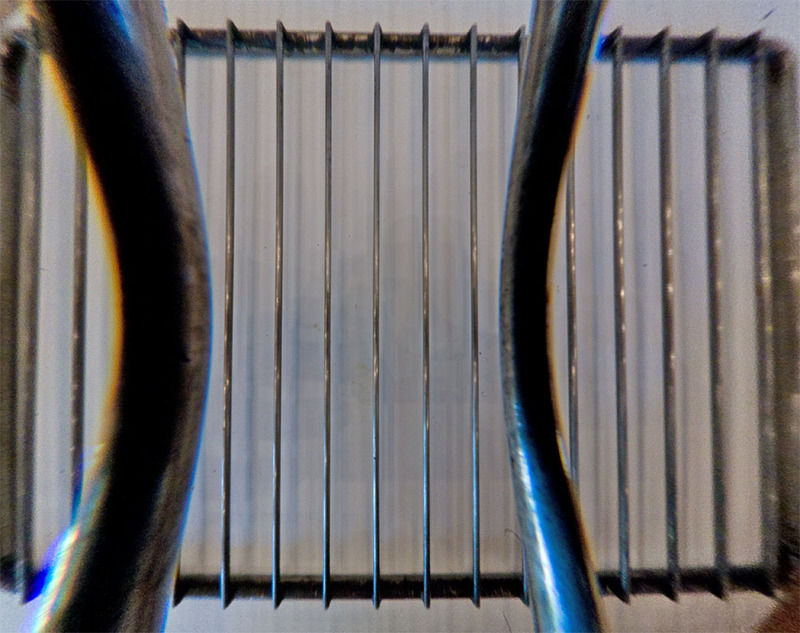 Two metallic grids are put about 6 cm apart and the fisheye lens lies on the upper grid. Canon EOS 5D Camera, Tokina 10-17mm fisheye lens. 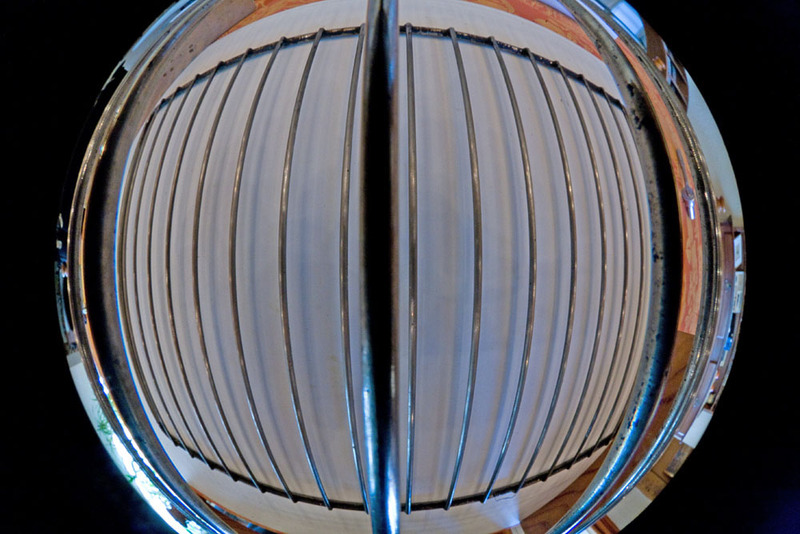 This is due to a specific property of the fisheye lens: the entrance pupil is seen at a position on the optical main axis of the lens at a varying position depending on the angle which the lens longitudinal axis is seen by the observer. In other word the NPP (no-parallax-point) shifts along the axis in function of the angle that the line joining the point of interest and the entrance pupil makes with the lens longitudinal axis. On most of the fisheyes that are intended to be mounted on (D) SLR, the NPP locations range from the front glass surface of the front lens to about 18-20 mm behind on the optical axis. 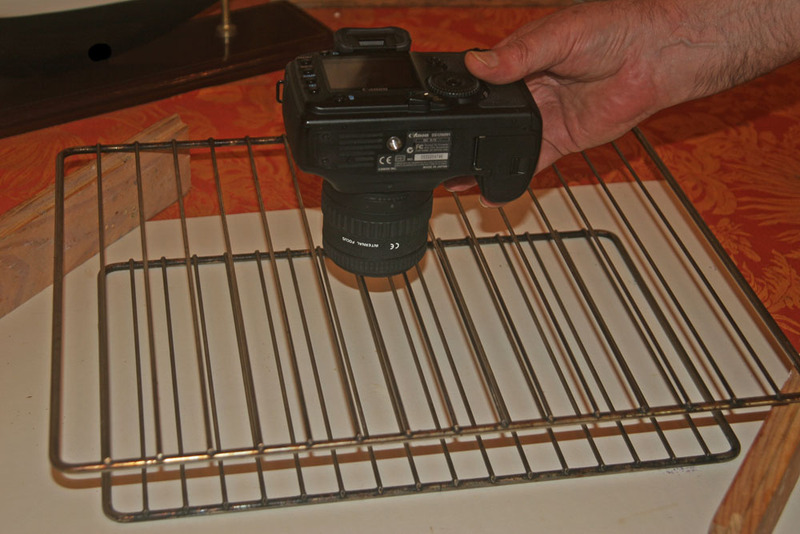 This correspond to ~97 degrees and ~0 degree angle respectively for the lens used here (i.e. Tokina 10-17 mm @ 10 mm). With some slight variation this is true for any fisheye lens including of course the Sigma 8 mm f4 for instance. 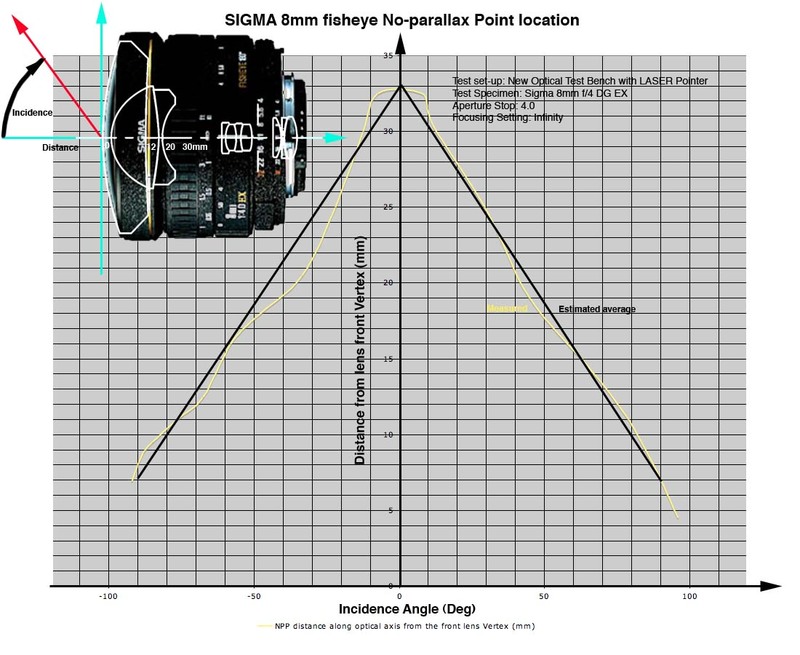 This shift is of no consequence if the point (or object) of interest is quite distant, but it has a strong influence on the position of the output image corresponding picture element (aka pixel) location on the digital sensor when the distance becomes small (e.g. few centimeters or few millimeters to the entrance pupil). This implies that unavoidable parallax errors shall exist on the seams between two images to be stitched. The center rod seems about straight and slim. So are the rods of the lower (and farther) grid. The two neighboring rods of the top (and near) grid are seemingly bowing (effect of NPP shift) and bulging (effect of perspective and NPP shift, combined) . NOTE: this "parallax" like error that bowes the shape of the very close straight feature exists even on this single image! This CubicQTVR movie is a composite that shows the strong bowing of the nearest straight object and the way this bowing effect decreases fast when the distance of the next object increases, etc. The fisheye images A and B above were corrected from usual Red-Cyan transverse color aberration (TCA) and the lower grid is therefore very neat after this correction. If you look closely at the rods of the upper grid and especially on the parts against clear white background, you shall see a very strong Blue-Yellow of what seems to be also lateral color. This "dual TCA" effect on the same image cannot be simply corrected with usual correction tools.